SONEPA manufactures a full line of plastic blasting media ideal for a vast range of uses including paint removal, surface preparation, deflashing, and contamination stripping. 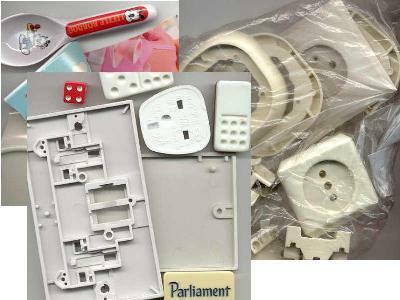 UF-401 Urea Formaldehyde Mouldings scrap and chipped mouldings from electrical accessories, dinnerware etc, white and pastel colours Barcol Hardness Range 54-62 Without dominos, metals, foils, black/brown components. 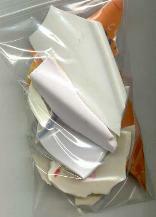 M-402 Thermoset Melamine Formaldehyde scrap: Melamine mouldings and chiped mouldings scrap, white and pastel colours. Barcol Hardness Range 64-72. Without dominos, metals, foils, black/brouwn components. Our PLASTIC MEDIA is manufactured in 2 major hardness types and 5 standard mesh sizes with specialty sizes available on request. The diversified PLASTIC MEDIA family of dry stripping abrasives meets the requirements of MIL-P-85891 — approved for use by the U.S. Army, Navy, Air Force and several armed services outside the US. Type II - Thermoset Urea Formaldehyde. 3.5 Moh Hardness; most heavily used type; significantly aggressive but forgiving. Selected applications: Fastest practical media for stripping aircraft, trucks, trailers, tractors, rail cars, vans, motor homes, marine vessels, cars, buses. Approved by U.S. Air Force for stripping airframes. TYPE V: Acrylic 3.2—3.5 Moh Hardness, longest lasting type. Selected applications: For stripping aircraft structures, trucks, trailers, tractors, rail cars, vans, motor homes, marine vessels, cars, buses. Considerably "more forgiving" in the hands of an operator. Used for a variety of applications i.e. mould tool cleaning, any delicate application where no surface alteration is permitted, paint removal from aircraft, deposits from glass fibre/plastic boats. Melamine is engineered for stripping the most difficult surfaces while providing an effective stripping rate. 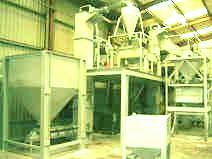 Melamine is the most aggressive plastic abrasive, offering an excellent range of stripping capabilities. Melamine can be used as a replacement for glass beads and other harsh abrasives. Highest aggression plastic blast media c. x6 aggression of Urea. SONEPA Copyright 2001. All rights reserved.